Happy long weekend to everyone! 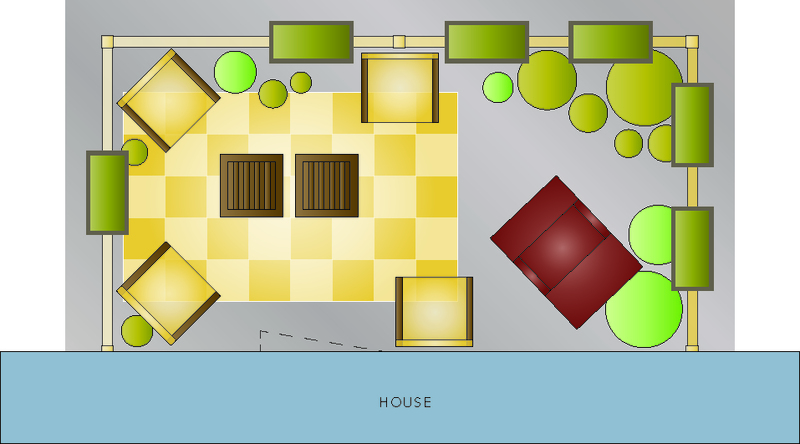 I've been hard at work so far trying to get some actual development for my patio oasis that I've been hankering for. So, from all my long hard studying (meaning watching the DIY or Home and Garden Channel) I've taken away the tip to start with a drawing! 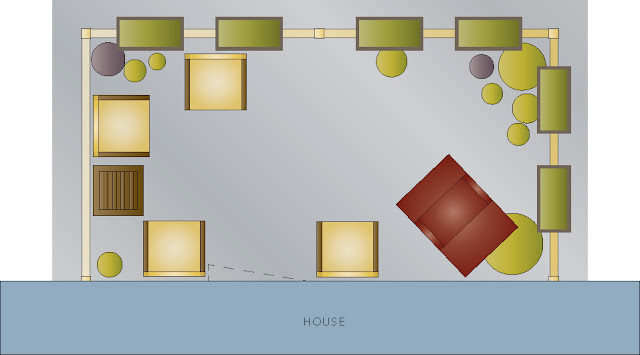 So I opened my trusty Adobe Illustrator program, grabbed my tape measure and went to work on sketching out the space to scale. 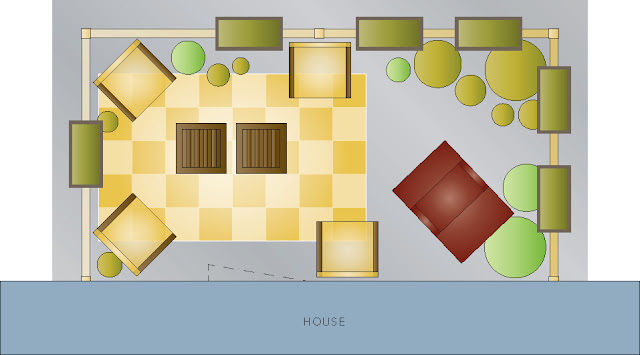 What you're seeing here is a birds-eye sketch of my patio. The grey base is actually the space I have to work with - isn't it crazy how the railing has a foot outside the actual patio area? I'm tempted to get a gutter system flanking the whole space that will have some type of beautiful shrubbery, but I'm guessing it is WAY out of my budget. For now, I'm going to stick to the interior space for improvement! 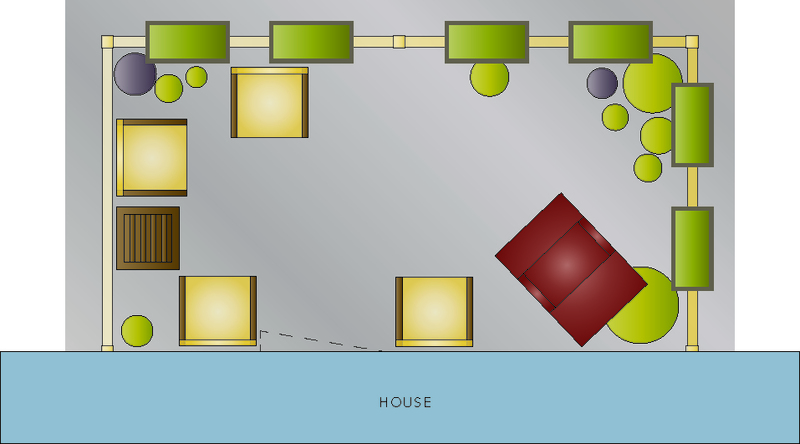 This is the current way everything looks - the yellow and maroon boxes are my chairs. All the green are my spaces where I have plants currently, and the black circles are plants that are in dire need of being re-potted. What is my goal for the space? To fill it with lots of green and color so that it feels like an amazing space - my own secret garden! What are those green 'troughs'? They are these awesome railing planters I scored for $7.50 a piece ($45 total) from Menard's. Right now they have lettuce in 2 (which are totally loving life right now, might I add), and herbs in another 2 (who don't know it, but they are going to soon be evicted). I think the lettuce definitely will stay, the herbs will be relocated, and these will be the more show-case, overflowing planters. The round planters on the ground will be where I plan to create mini-systems of different types of garden goodness. I'm not sure quite how I'm going to do this, but the game plan is to head to the store - get all the plants I like that love lots of sun, and physically layout everything on the spot. Probably not the best plan of action, but it's all I've got so here goes nothing! Here is my goal plan for now. I'd love to find some kind of outdoor rug to set the scene and make this space feel more like a room. I also want to make it a bit more inviting for guests to come over for a happy hour cocktail or two, or four! I also need to invest in a few more larger containers to make this scene happen, and am not sure how, but would like to get a feeling of being surrounded by greenery and wonderful smelling things! Today I rounded up a mess of flowers, herbs, and filler foliage to begin the space. Heading to the nursery is so overwhelming by so many choices, but I figure this project is not a one-and-done type of job. It will be an evolution and ever changing adventure throughout the summer!